Brazil on a journey to something great! Most commentators were taken by surprise when President Lula da Silva embarked on what was to become 2 presidential periods and 8 years of fantastic development for the country. Elected on a political platform well to the left, and with substantial elements of populism, President Lula managed to negotiate politics and maneuver with pragmatism way beyond expectations. President Lula handing over a strong vibrant and growing economy to his successor. 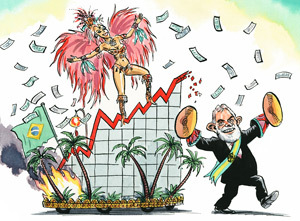 With close to 200 million inhabitants and the 10th largest GDP in the world, Brazil has definitely moved away from political chaos and hyperinflation. From here onwards, Brazil sits at the table when G20 meet. And the BRIC countries have become a power acronym we need to follow; Brazil, Russia, India and China. And now, to underline the progress of Brazil, the first women as President is about to take charge: Dilma Rousseff. Anders, from a winter cold Gjøvik, Norway – listening to João Gilberto to stay warm. For decades, Brazil has in many people’s eyes been the promised land, land of the future. Everybody saw a huge potential – one day. 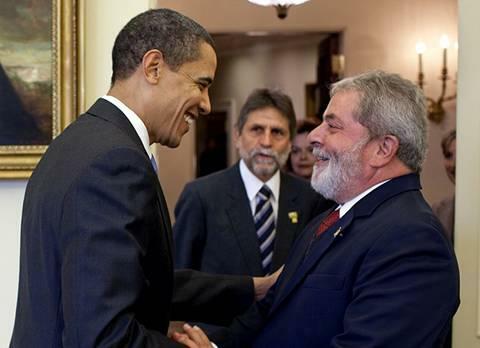 President Obama receiving President Lula in Washington. And now the official numbers start to prove it too. A vibrating, well diversified economy with a home market of close to 200 million consumers need to be listened to, and need to be taken seriously. Anders, Gjøvik, Norway as Easter is on its way and Norwegians follow the snow and ice up into the mountains. March 30th, 2010. When a disaster happen, the transparency and connectivity of the flat globalized world seems to excel in prompting swift and immediate action. News coverage delivered through Skype gave live reports very soon after the earthquake hit Haiti. Video coverage of the quake recorded on numerous mobile phones documented how serious this earthquake was. Together, all these instant reports helped reduce significantly the time by which rescue missions was on the way to Port au Prince, Haiti. And within a week, a whole world was engaged in numerous activities to gather monetary and other help to the country. We are moving forward towards a better world! Hence, another positive aspect of globalization. As soon as help started to arrive Port au Prince, Haiti, it became evident that the world is basically unprepared for coordinated action. The main question is: Who should be in charge? From joint operations in i.e. Afghanistan we know how hard it is to coordinate multinational, multifunctional organizations. This becomes even more difficult when an emergency strikes, and we need to get coordinated actions up and running very fast. The world need to move forward, and here we have a major task to solve and prepare for before the next big disaster. Anders, from a snow covered Gjøvik, Norway. Copyright 2010 Anders Haug Thomassen. You are encouraged to use this material as long as you mention the source. Latin America never lacked natural resources, but they have not always been easily accessible. This is now about to change. Numerous projects are crisscrossing this exiting continent linking the Pacific Ocean to the Atlantic, linking the metropoles of Buenos Aires and São Paulo, linking the interior to the coasts. Roads, railroads and waterways are opening new and cost efficient access to the vast hinterlands. This has enabled Brazil to explore its savannas and become the world’s second largest exporter of soybeans. But equally important, it has enabled Bolivia to develop and claim the position as the world’s sixth largest exporter of soybeans. Latin America’s trade routes historically went from the coastal cities to Europe and USA. With the changes in flow of traffic, the interior will be transformed rapidly. 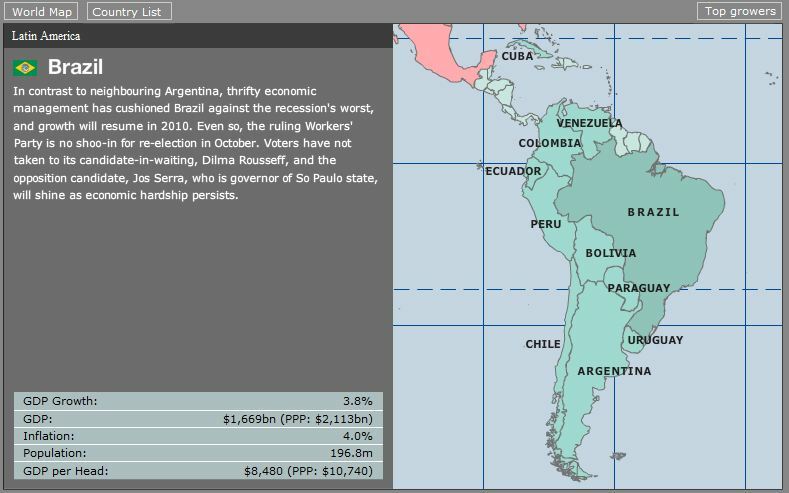 Landlocked countries like Paraguay and Bolivia will prosper tremendously on these changes. And with the new highway project from Buenos Aires to São Paulo, sleepy Montevideo might wake up. Latin America is holding huge resources of renewable energy, and a project financed by the Inter-American Development Bank is about to complete an integration of the energy grid. When this happened in Europe, it became an engine for growth and development. This will enable even the more remote Central American countries to reap benefits and be part of the growth in the region.